A photograph of the flooded Red River, nearly submerging the Louise and CPR bridges, taken from the roof of the Rover Street hydro station. Other flooded buildings can also be seen. A photograph of high water surrounding a causeway that ran to the Rover Street hydro station during the 1950 flood. A photograph of the Rover Street hydro station, surrounded by water, during the 1950 flood. A group of people are walking on the sandbag dike that surrounds the building. 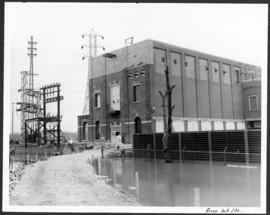 A photograph of high water surrounding a power house during the 1950 flood. A photograph of children on Higgins Avenue during the 1950 flood. Piles of earth and sandbags line the street. A photograph of a brick building on Robert Street during the 1950 flood. The building is surrounded by a sandbag dike and water.